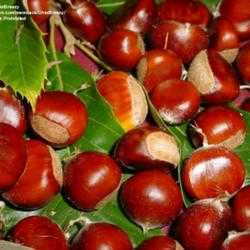 Years ago my brothers carried a seed of red buckeye in their pockets for luck. Most folks would argue that such a practice would have no impact on a person's luck. Other people realize that my brothers' outlooks on life were more positive simply because they spent time in the woods. Having the seed in their pockets conjured up pleasant memories of the woods and nature that helped them to see their cups half-full. In early January the swelling buds of the red buckeye (Aesculus pavia) are evident. Then in early February, dark green palmately compound leaves with prominent red stems and leaf veins unfurl. What a welcome sight the tender leaves are-and how bold the tree is to leaf out at a time when freezing weather is apt to turn other plants into brown mush! Not the red buckeye, though. The seemingly delicate young leaves are impervious to the cold. The red buckeye definitely catches the eye of those who see it in landscapes and woods. After the leaves emerge, bright red clusters of flowers three to six inches long bloom at the tips of branches. Early-returning hummingbirds stop in for a sip of nectar, and as they go about their business, the plants are pollinated. The website at Operation RubyThroat lists the red buckeye as one of the top ten native plants for attracting hummingbirds to the garden. Red buckeye usually stays under five feet tall in the Deep South. However, there are exceptions. One at Eden State Park in Point Washington, Florida, is about 12 feet tall. 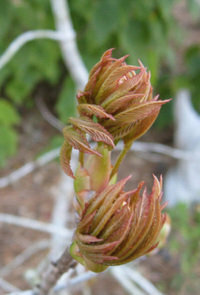 Farther north, the red buckeye may grow as tall as 25 feet. Native in USDA Zones 5 to 9, the red buckeye can be found on riverbanks and in rich deciduous woods throughout the southeastern United States and west into Texas. Its preference is for moist but well-drained soil and partial sun. 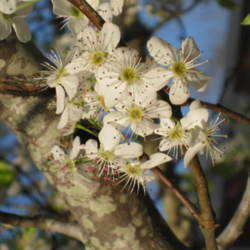 However, it will produce flowers on shady sites, and moderate salt tolerance allows it to grow near bodies of salt water. The red buckeye seems immune to most pests and diseases. Following the flowers, round, one- to two-inch brown seeds develop. While squirrels and mammals eat the seeds with no ill effects, they are toxic to humans. Seeds germinate quickly when planted in moist soil and can be expected to flower about three years later. 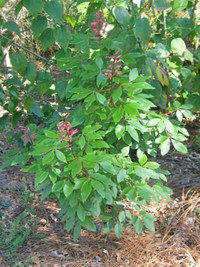 Use red buckeye as a specimen plant, or include it in a shrub border or natural area of the landscape. Although branches develop naturally near the ground, they can be limbed up to make a small standard. Do not think that something is wrong when the leaves start falling as early as September. Remember that it leafed out very early in the spring, and it has had its day in the spotlight. You might appreciate the bright brown or tan bark in the winter landscape, for it is quite showy. My brothers thought that the seeds of the red buckeye resemble a buck's eyes, and I suppose that's how it got its common name. Amiable Spouse says that it is a good worry stone. Rubbing the smooth, hard covering soothed frayed nerves when he was all out of patience with his art students. It helped him to remember the place where he found the buckeye, and so he was transported back to a pleasant place and time. Frazzled nerves settled down, and he was more able to meet the needs of his budding artists. 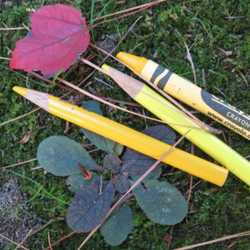 If you want something a bit different, you might search for cultivars of red buckeye. For deeper red flowers, look for 'Atrosanquinea'. If space is very limited,'Humilis' might fill the bill with its low, prostrate habit and small clusters of red flowers. Plants can even be found that have yellow or white flowers. Similar species are Ohio buckeye (Aesculus glabra), painted buckeye (A. sylvatica), and bottlebrush buckeye (A. parviflora). Serving as a Master Flower Show Judge, a Floral Design Instructor, instructor of horticulture for National Garden Clubs, and a University of Florida Master Gardener immerses me in gardening/teaching activities. In addition to these activities, I contribute regularly to Florida Gardening magazine and other publications. I am author of four gardening books, all published by Pineapple Press, Sarasota, Florida. Read about them and visit me at www.mariesgardenanddesign.com.